Have you ever dreamed of making your Halong Bay experience the most magical of all times? As the sun ends its course behind a skyline of gigantic rocks rising up the mythical emerald waters, we take you right to the heart of fantasy and wonders by hosting a dinner in one of the caves of the Bay of the Descending Dragons. There are few cruises offering this feature on their trips. 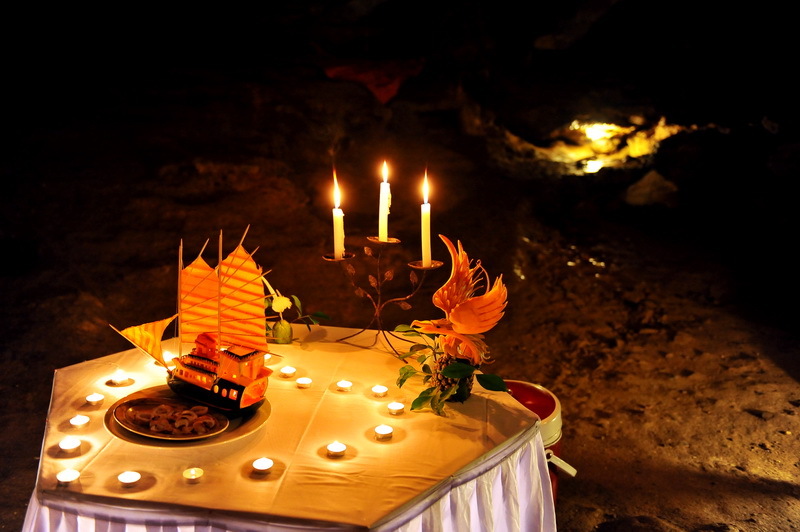 The crew members will prepare a delightful diner in a cave. In some cruises, this activity is already included. In some others, this is an optional extra-paid activity. Follow Vietnam Typical Tours and you will find what can make your day! After a long day of swimming, kayaking, and many other activities, nothing beats a chill moment to relax. 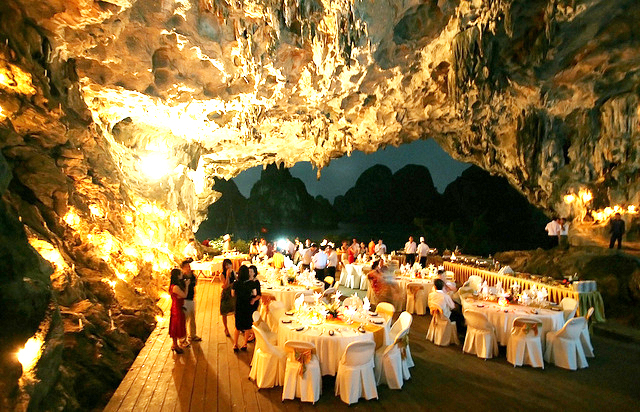 There a company came up with the idea of letting tourists have an amazing dinner in a cave. This feature has been receiving many praises from the customers. Most tourists used this dinner for special occasions like a birthday party, a romantic dinner, conference group, or a small wedding with less than 60 guests. The dinner will be an unforgettable experience as much for the delicious and beautifully presented food, as for the romantic setting. They have fresh Halong Bay seafood along with Western cuisine and Eastern cuisine for those who want a change from all the seafood they have been having in Halong. 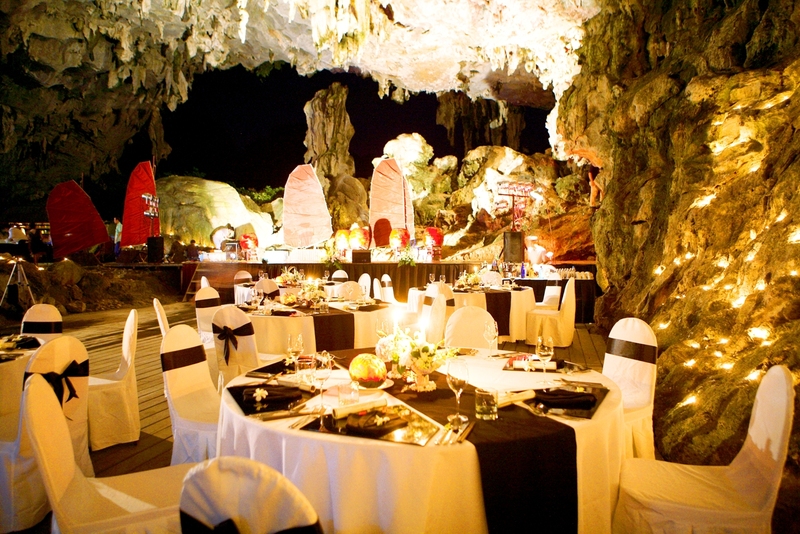 Arriving in front of the cave, the candle light will lead you to the place where the tables are set- up, the food is well- decorated and ready to be served, the staffs welcome you. You are like to be in a different world with warm welcome, being private and romantic to enjoy. Pass through the cave’s mouth and along the candle-lit pathway for the most enchanting of experiences. Allow yourself to be bewitched by the mystical scenery inside. The colourful of the light makes cave look like mystery, now, visitors just enjoy the dinner as the King and the Queen inside of the cave. Love melody for cave dinner starting In addition, bartenders will complete your unforgettable night with excellent mix drink and lovely beer. In Halong Bay, it is organized mainly in Trong Cave (Hang Trống), Amazing cave…In Bai Tu Long Bay; it is arranged in Thien Canh Son Cave. Most of the cruise operators can offer you this service. In fact, it is mainly held by the luxury cruises. The additional price is high as it includes: cave-hiring, set- up fee, food, personnel. The additional price depends on how big your group and related requests. This dinner will be one of the best dinners you ever have and the Halong trip will be stay as a wonderful journey in your memory. If you are coming to Halong Bay, it would be such a waste not trying this feature out. Let be the luckiest person who is able to find the best dinning held in Vietnam Typical Tours Halong Cruises catalogue.